March 2019 was the 56th anniversary of country music star Patsy Cline's (1932-1963) tragic death in an airplane crash. Campbellsville Industries, provided the 40 ft.Patsy Cline Memorial Tower and carillon for her gravesite in the Shenandoah Memorial Park in Winchester, VA in 1987. The AIA Baton Rouge Chapter has just awarded this renovation project the Gold Metal Rose Award for excellence in historic renovation! 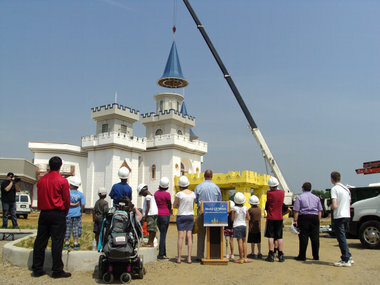 the 33 ft. high Campbellsville steeple topped off the project, and housed 3 bronze bells. The 3 ft. cross has a 23 1/2 K gold leaf finish. Architect: Cockfield-Jackson, Architects. G.C. : Faulk-Meek General Contractors. BRW-Architects prove that classic architecture results in an elegant church design! Campbellsville Industries was able to reproduce their design exactly, bringing their vision on paper to reality. The steeple has a Cream Kynar finish for the body of the steeple, and 20 oz. natural copper for the spire and cross. Kenbridge Construction was the G.C. This historic church was established in 1644, and when accuracy and attention to detail were needed to replicate the old steeple and weathervane to accept modern cellular phone antennas, they chose Campbellsville Industries. The weathervane has 23 1/2 K gold leaf finish. The bottom photo shows the Senior Minister, Rev. Mike Duda, during the blessing and dedication service on the Wenham ladder truck. Cell providers are MetroPCS and T-Mobile. Who says they don't design and build them like this anymore? An elegant cupola, 4-way clock system, final, railing an cornice; designed by CMW Architects and Engineers in Lexington, KY. Construction Manager: Codell Construction of Winchester, KY.
A classic cupola, after the style of Independence Hall and fabricated by Campbellsville Industries for the Dr. Edward L. Hutton School of Business. Cumberland University's blend of traditional architecture throughout the campus, complimented by the beauty of the scenic mountain setting, creates one of the most Idyllic and picturesque campuses in the nation. Johnson Early, Architects; Hacker Brothers, G.C. Campbellsville fabricated the cupola, balustrade railing, and clock system for the Lindner Building at Elon University. Architect: Spillman-Farmer, Architects; G.C. : J.H. Allen of Asheboro. U.S.News & World Report named Elon the nation's No. 1 "School to Watch" in its 2009 "America's Best Colleges" guide. A beautiful traditional steeple is always in style, especially when accented with a Classic Copper finish on the spire and transition roof areas. This metallic copper finish does not turn green and keeps the "bright copper penny" look for many years to come. Everything from the masonry upwards is a maintenance-free Kynar finish. This attention to detail is the "Campbellsville difference". Cell-phone antennas do not have to be be put in a large unsightly tower. They can be housed in a Campbellsville steeple. Check out our cell-phone steeples. Cellular Tower...or Not? Which Would You Prefer In Your Neighborhood? When the First Church of Christ in Unionville was approached by a cell-phone carrier as a possible site for their cellular antennas, the first thought was "We don't want to ruin the traditional architecture of our church". The antennas had to be concealed in a steeple and the steeple had to blend in with the architectural styling of the church. It couldn't be some company's cookie cutter stock design that would look like it was put on as an afterthought. That just wouldn't be acceptable. The church contacted Campbellsville Industries, and had a custom steeple designed that incorporated some of the architectural motifs of the building and blended in beautifully with their surroundings. Communities today do not have to settle for unsightly towers and phony faux pine trees and palm trees to conceal their cellular antennas. A church can get the steeple that they wanted, a monthly income stream, and the cellular provider now has a site that is "community friendly". It's a win-win situation for all parties. Communities don't have to settle for less when the solution is just a phone call away. Call or email Campbellsville today for your quote! Check out some of our other concealment solutions on our cellular steeple page. Phone: 800-467-8135. Campbellsville Industries provided the historic reproduction of the clock tower, and complete cornice system for the Muhlenberg County Courthouse, including: dentils, modillions, paneled railing, gabled pediments, and scrolled brackets. The clock tower has the largest open belfry of any pre-fabricated cupola in the United States. The tower is 56'-5" in height, and the base measures 36'-4" wide. The cornice has an overall vertical height of 3'-3", with a 2'-2" projection. Campbellsville provided new clock dials for the existing gear driven clock movement that was refurbished. The original bronze bell was also refurbished and is struck by a hammer driven via the clock movement. Architect: Craig Thomas of RBS Design Group. Construction Manager: Codell Construction Company. Billed as "The Historic Replication of the Decade" - Campbellsville Industries has returned the famous 225' Hoboken clock tower to the New Jersey Ferry Terminal on the waterfront of the Hudson River, where it was originally constructed 100 years ago. The project has also garnered Campbellsville Industries a 2008 Merit Award for Excellence in Architecture by the New Jersey Chapter of AIA. The Ferry Terminal is located across the river from Manhattan. The clock tower is part of a 100-year anniversary of the birth of one of the most renowned transportation centers in the United States. This clock tower is the largest prefabricated clock tower in the world and is designed to withstand 120 mph winds. Phase 1 and Phase 2, included the window and clock section of the tower, and Phase 3 includes the open belfry and and hipped roof with finial - all clad in 20 oz. copper left in its natural state to age to a green patina to match the copper on the terminal building below the tower. The four clock dials are 12 ft. diameter and are backlit at night. The "open" belfry actually is enclosed with bird netting inset in copper frames. The 4 ft. high vertical copper letters spell out the word "Lackawanna", and are illuminated by fiber optic lighting. Click on the photo for more images of the installation of this phase. You can read more about the clock tower in Engineering News-Record. Campbellsville Industries' is actively involved in helping to restore and preserve America's architectural heritage, by replicating historic cupolas and clock towers that have been removed from our courthouses through time and neglect, or those that have fallen into a state of disrepair. You may view some of these historic projects such as the clock tower restoration on the Bell County Courthouse in Belton, TX., the Montgomery County Courthouse in Clarksville, TN, the Nassau County Courthouse in Fernandina Beach, FL, or the Milam County Courthouse in Cameron, TX. Campbellsville Industries celebrated 57 years of continuous service to the church and construction industry in 2012. Campbellsville Industries pioneered the prefabricated church steeple and cupola and thus rightly earned the nickname "The Steeple People"?/font> from architects across the country. We have over 18,000 installations scattered throughout the 50 United States, Canada, Mexico, and at least six foreign countries. Our trained installation crews log over 500,000 road miles annually. Campbellsville Industries was established in 1955 by local Campbellsville College (now Campbellsville University) president Dr. John M. Carter, as a practical means of obtaining funds for hard-pressed students. From 1955 to 1965, 412 students worked their way through college while at Campbellsville Industries to help pay their college tuition. Campbellsville Industries makes a very sustainable and environmentally friendly product. Our steeples, cupolas, balustrade, railings, cornices, and louvers; are fabricated from structural aluminum extrusions, and most are clad in aluminum. The use of aluminum in the fabrication of our products, unlike some materials used by other manufacturers, means that not only does the customer benefit from the lightweight and maintenance-free advantages of this material, but also the environment benefits from the use of aluminum. These benefits are compounded when you choose to recycle aluminum in the products you buy. Recycled aluminum is identical to smelted aluminum, except for one thing: it takes only 1/20 of the energy to make it. Less energy means reduced greenhouse emissions. And like few other materials in the recycling chain, aluminum recycles over and over again. Almost 70% of the aluminum ever produced is still in use, equaling 480 million metric tons (529 million tons) of a total 690 million metric tons (761 million tons) manufactured since 1886. The extrusions and cladding that are used in the manufacture of our products have high recycled content, which benefits in the LEED certification of your project. Approximately, 95-98% of the materials our typical products can be recycled in the future. Campbellsville's mission is to make a both a sustainable and architecturally beautiful contribution to the world in which we live. The use of Prefabrication / Modularization is key in achieving sustainably in GREEN projects. Check out our link for more information on this subject. Ask us about our LEED friendly products! The Make-A-Wish Foundation?/sup> of New Jersey has been granting wishes for seriously ill children in the state for 24 years. Two years ago, the Foundation made its own wish: to construct an imagination-inspiring building ?a wishing place ?for seriously ill children. The building would have a castle-like exterior and a magical, child-centric interior. It would be a place where children who face life-threatening medical conditions can believe once again that wishes can come true. This magical building would be the only one of its kind on the East Coast and only one of three such buildings in the United States. It would become A Wishing Place. Campbellsville Industries is pleased to have been a part of this special project, by providing the three castle towers and battlements. Dozen Distinctive Destinations for 2007 by the National Trust for Historic Places. Campbellsville's steeple on the historic St. Augustine's Church in Philadelphia, has a starring role in the plot of this movie! The beauty of traditional wood millwork, but without the traditional maintenance! Employees, Darrell Davis and Burr Hearon, were recently recognized for 50 years of service to Campbellsville Industries. Campbellsville Industries products are proudly made in Kentucky, and are part of the "Unbridled Spirit" of Kentucky. There is only one Campbellsville Industries, and no one builds a stronger steeple/cupola structure. Ask us about the Campbellsville Difference and why we are "The Steeple People"! Proud Japanese pastor stands beside his newly installed Campbellsville steeple and gold leafed cross. Cell-phone antennas concealed in a traditional cupola on the beautiful mountain surrounded campus Main Hall building. Copyright ?2006 Campbellsville Industries, Inc. All rights reserved. and you must have AutoCAD software to open CAD drawings.